I've added a few enhancements to my ST-10XME. 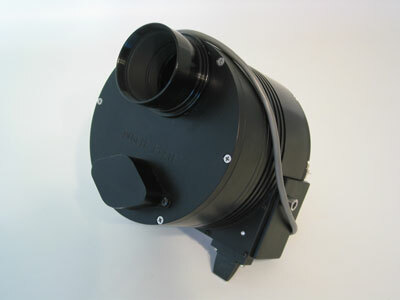 A Mandel Muscle Plate replaces the standard cover that comes with the CFW-8A filter wheel. I've also attached an angle bracket to the side of the camera (right image) to "tame" the loose cable problem that plagues the ST line of cameras. A 1/4"-20 x 3/8" long hex head cap screw was used to attach the bracket to the camera via an existing threaded hole on the camera body. The CFW-8A's 10-pin connector plug was bolted to the top of the angle bracket through an existing screw hole on that plug. 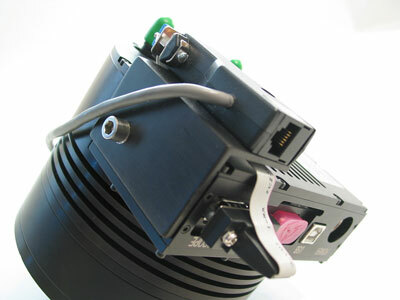 A short 10 conductor ribbon cable was fabricated with plugs on both ends to connect the camera to the CFW-8A plug, with the ribbon cable running safely under the angle bracket. 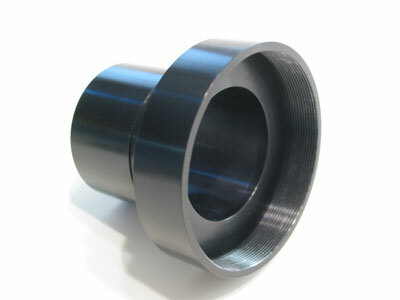 Ultra Low Profile Adapter (ULPA) and custom machined nose piece. image at right) to mate onto the male end of the ULPA and a 2"
the expensive Precision Instrument Rotator (PIR) package. works great at a fraction of the cost. The Philips ToUcam Pro II Model 840 validates the old saying, "Good things come in small packages". The planetary and lunar images that can be obtained with this webcam are absolutely amazing. 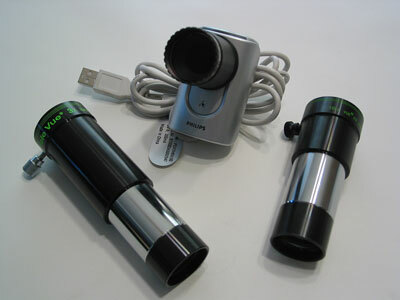 At only 2% the cost of my ST-10XME CCD camera, this little webcam is a real bargain and provides hours of entertainment. 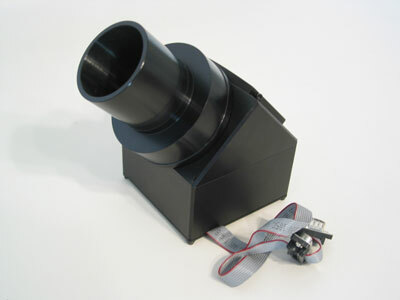 Pictured here, the camera is equipped with a Moog 1.25" adapter and Baader UV/IR cut filter. Depending on the target and the telescope, I use either a Televue 2x or 3x barlow when shooting video. Image acquisition is accomplished using the Philips VLounge software bundled with the camera. For image processing I use RegiStax, avi2bmp, and Adobe Photoshop CS.